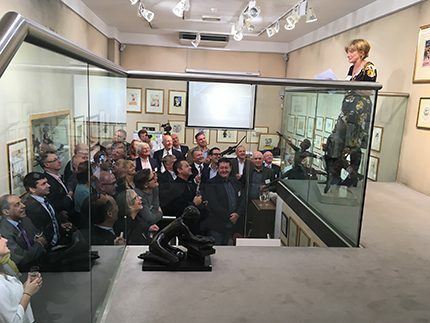 Fuel Oil News celebrated its 40th anniversary at the Chris Beetles Gallery at St James’s in London on Thursday 16th November. We were delighted to welcome readers and advertisers to the event, which also saw the launch of the new Fuel Oil News interactive storage & terminals map. Over the past 40 years it has been a real pleasure to share the industry’s news and views. Having such a great network across the fuel oil distribution industry, guests at the 40th anniversary event were soon chatting avidly. In addition to the gallery’s latest exhibition – The British Art of Illustration 1900-2017 which, in itself, was an excellent talking point, there were also bound volumes of Fuel Oil News on display, including the very first issue from November 1977. These issues together with several front cover photographs brought back a host of memories and prompted many interesting and funny anecdotes. For a flavour of the event look here. And look out for photographs in the January 2018 issue of Fuel Oil News. To share your very latest news with Fuel Oil News, please email jane@fueloilnews.co.uk.